As the usage of computers, networks and Internet has grown in the business, the need for success departments has increased as well. Back in the day most of the companies were just fine with one or two in-house customer experts. Today this model is no longer effective. Businesses started expanding their success teams into departments that over time became more than just a typical IT maintenance. But to fully understand the importance of these departments, one needs to know what success team does and how it works. 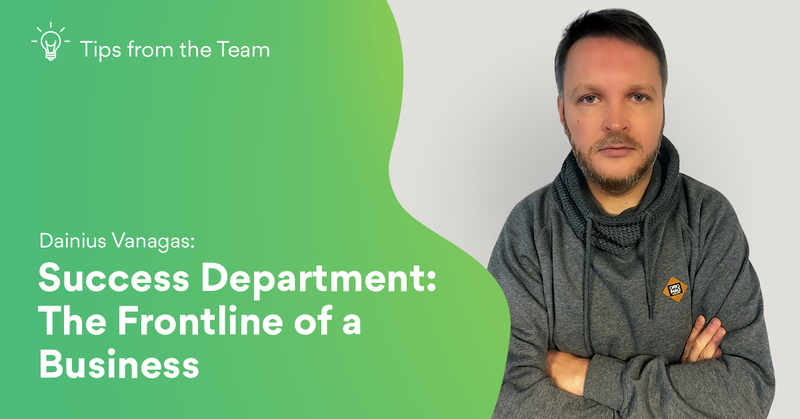 So we talked to Dainius Vanagas, a Head of Customer Success Department here at Tesonet, to finally get an idea of the role it plays in business. So let’s start from the beginning. What do success departments do? Well, it really depends on what kind of business it is, because the definition of it might slightly vary. But in general, success centers make sure that the customers using some kind of product or service, are happy with it. For instance, we help everyone to find their answers related to our cybersecurity products. Every single day and night we chat or write emails – we never stop! Many think that success departments are just for huge IT companies. What kind of businesses has them? Every great business has them – from Google to your local drug store. It might have different names – some call them support centers, happiness management teams and etc. But I can’t imagine running any business without a person, a team or a whole department dedicated to that. These people are extremely important to any kind of organization interacting with clients. Many pieces of research show – the most successful IT businesses are extremely good at being accessible and maintaining relations with users. Sales and marketing make people buy, but success centers make sure they’re happy and they stay. As customer success managers, our main job is to assure premium user experience related to the services we provide. Here we help with all the technical questions and occurring issues or just chat about latest grumpy cat meme. Having easy access and quick solution to someone who can help you – this is what users want. And we are really good at that! What kind of organizational structure success departments have? Again, this really depends on the business and how big their department is. There’s no one set standard – many just figure out what works for them. As for our success center – we consider ourselves a bit more flexible with our structure. We want to give people a chance to experience as much as possible. So, we focus on working in teams. At our department, we have 3 big ones and then we have several a bit smaller teams. Because of this “structure”, people get to communicate with each other and learn about different IT business aspects. This creates many opportunities for growth and continuing your career in various areas. You learn how other types of departments work and can figure out what career path you want to pursue. We have many people starting their career here as managers and later on becoming developers, SysAdmins and so on. How success departments are different from typical call centers? Unlike many support centers, success centers are more flexible. For instance, here we don’t really care how long your coffee break was. The main thing we look at is whether a customer was happy with your assistance or not. Our goal, as mentioned before, is to create premium user experience – and that’s the most important thing for us. Another big difference is that we do not do calls – with busy clients all around the world, emails and chats are the most convenient way to communicate. Also, some cases might be really complicated and to solve some issues, you need more people involved. Phone calls are not good for that, so we use emails and chats all the way! What skills are necessary for working in a success department? This job is all about people, so you need to be kind and wear a good spirit! Also, English is essential as well since the clients today are all around the world. These are just the basic ones you need just to start. Other skills you will attain through practice and while building your career.